우리는 마스터리(통달)의 태도와 책임을 사용해 존재하기 위해(Be) 행동을 연습합니다. 무엇이 되기 (Become) 위해서가 아닙니다. 부디 태도와 책임을 심사숙고하기 바랍니다. 하나하나 주의깊게 읽고 실천에 옮기십시오. "태도와 책임"은 당신 개인의 크리스틱 힘을 되찾을 수 있는 로드맵입니다. 컨택을 준비하는데 있어, 통달의 태도와 책임은 고차원 문화와 통합을 이루는데 필요한 정신-감정 의식변화를 보조합니다. The pre-ancient Melchizedek Cloister Emerald Order (MCEO) perspectives teach of the Inner Christos, or living God-spirit alive within all things, including the natural environment. Inner Christos philosophies are built upon understanding of what is referred to as the Law of One. Inner Christos Law of One perspective respectfully acknowledges the inter-connection, interdependence and intrinsic value of all components of reality in recognition that the Living Consciousness, God-Spirit of Inner Christos, is the tangible substance of consciousness and energy from and of which all things manifest are composed. The word Christos was originally spelled Kristos in the most ancient texts, and referred to the personal Divine Blueprint of Conscious Living God-Spirit energy of which all things and beings manifest are made. MCEO inner Christos Law of One teachings, Templar Sciences knowledge and Pre-ancient History records of the CDT-Plate teachings represent an intrinsically congruent paradigm of universal understanding; collectively the MCEO teachings are referred to as the Emerald Covenant Freedom Teachings and are a subset of a very ancient set of texts called the Maharata Texts. 고대-이전 MCEO(Melchizedek Cloister Emerald Order, 멜기세덱 클로이스터 에메랄드 오더)는 내적 크리스토스, 자연환경을 포함한 모든 존재 안에 살아있는 신–영혼 관점을 가르칩니다. “내적 크리스토스” 철학은 “하나임의 법칙(Law of One)”이라 불리는 원리를 바탕으로 합니다. "하나임의 법칙"의 내적 크리스토스 관점은 살아있는 의식, “신–영혼” 또는 “내적 크리스토스”가 분명한 실체를 갖는 의식이자 에너지이며 모든 존재의 현현이 그로부터 생겨난다는 것을 인정함으로 상호연결성, 상호의존성과 모든 실재의 구성요소가 갖는 본질적 가치를 존중하고 인정합니다. “크리스토스” 라는 단어는 원래 대부분의 고대 텍스트에서 “Kristos”로 되어 있으며 모든 사물들과 존재들의 현현이 그로부터 기원하는, 의식적인 살아있는 신–영혼 에너지의 개인의 신성한 청사진을 가리키는 말이었습니다. MCEO 내적 크리스토스 하나임의 법칙 티칭, 템플라 과학 지식과 CDT-플레이트의 고대-이전 역사 기록은 본질적으로 일치하는 우주 이해의 패러다임을 대표합니다. MCEO 티칭은 에메랄드 규약 프리덤 티칭(the Emerald Covenant Freedom Teachings)으로 칭하며, 마하라타 텍스트(maharata Texts)라 불리는 아주 오랜 고대 텍스트 전체의 일부입니다. In a Kristiac society, we naturally epitomize the Impeccability of Eieyanic behavior. This standard is called the Attitudes and Responsibilities of Mastery. These Eieyanic standards do not embody the freedom/luxury to exercise our distortions. They do not permit us to hurl insults at another, take another’s inventory, point fingers, exhibit racism, etc., all things considered “freedom of speech,” or “freedom of expression.” They are expressions, but of what? Stepping through the ascension portals requires alignment of a certain percentage of our personal shields to the Divine Blueprint and continuously open to Primal Life Currents. The Freedom Teachings(FTs) were given to help us heal and remember our true Divine heritage, which facilitates the essential potentiality for our personal opening to the increasing influx of Primal Life Currents. 크리스틱 사회에서 우리는 이야니적인(*Eieyany: 9558BC ‘아틀란티스 몰락’이래 CDT-플레이트를 보호해 온 지구의 특정 인디고 아이들 혈통 라인) 행동의 완전무결성을 보여주는 자연스런 전형이 됩니다. 그 기준이 ‘통달의 태도와 책임’입니다. 이 이야니적인 기준들은 우리의 왜곡을 행사할 정도의 자유/사치를 구현하지 않습니다. 다른 사람들에게 모욕을 주거나, 그들의 문제를 떠안거나, 잘못을 지적하며 손가락질 하거나, 인종차별을 하는 등등을 허용하지 않습니다. 모든 것들은 “스피치의 자유”, “표현의 자유”로 간주됩니다. 그러나 무엇의 표현인 겁니까? 상승 포털을 통과하기 위해서는 우리 개인 쉴드의 특정 퍼센티지가 신성한 청사진과 정렬을 이루어야 하며, 지속적으로 근원 생명 전류와 통해야 합니다. 프리덤티칭(FTs)은 우리의 신성한 유산을 기억하고 치유하는 것을 돕기 위해 우리에게 주어졌고, 증가하는 근원생명전류 유입에 우리 개인이 더욱 개방될 수 있는 근본적인 잠재력을 촉진합니다. The FTs illustrate how to move from a decomposed state to a state that would support a higher order outcome. The conditions of our consciousness and the thoughts we think will either lead to a steady rate of frequency accretion and stabilization or to a state where we are constantly behind the power curve. We bring in more frequency and feel the expansion, and then non-Kristiac thoughts and their accompanying states of consciousness result in a contraction of the frequency. Instead of accreting more Kristiac frequency, we end up accreting more non-Kristiac frequency. It is one thing to have techniques available that would allow us to bring in more frequency to heal, but once the frequency comes in, how does it stabilize? This is where the Attitudes and Responsibilities of Mastery come in. FT는 (의식이) 어떻게 분해(분열,해체)된 상태에서 고차원 질서 결과를 돕는 상태로 이동하는지를 분명히 보여줍니다. 우리 의식 조건과 생각하는 사고들은 프리퀀씨 융착과 안정화로 꾸준히 이어지거나, 그렇지 않을 수도 있습니다. 더 많은 프리퀀씨를 융착할수록 우린 확장감을 느낍니다. 크리스티악하지 않는 생각들과 그에 수반되는 의식 상태는 프리퀀씨 수축을 초래합니다. 보다 크리스티악한 프리퀀씨를 융착하는 대신, 크리스티악하지 않은 프리퀀씨를 융착하게 되는 것입니다. 테크닉은 우리가 더 많은 프리퀀씨를 들여오도록 만듭니다. 그러나 프리퀀씨가 들어오고 나선, 어떻게 안정화될까요? 들여 온 프리퀀씨를 안정화 하는 것이 바로 통달의 태도와 자세입니다. 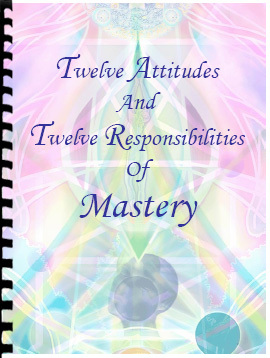 The Attitues and Responsibilities of Mastery are guildlines to help us develop a depth of composure, to set an environment in which, Divine Right Action and Divine Right Order can be realized. In deciding whether to explore this area of Mastery, we have to exercize the power of choice ….and then act. This can be called the Choice and Action Mechanism. Embeded within this mechanism are the conditions of being aware, awake and able. In order to more fully align with our Heroic Probability, we condition ourselves to be more aware of what we are doing and saying. We strive to be more awake or 'conscious" of what we are actually creating in our hologram. And then we act! We use the Power of Choice to either move towards a state of negative composure (de-composed) or towards a state of positive composure(composed), which results in either a plus or minus level of Divine Right Expression and/or Divine Right Action in our hologram. This results in an essential shift in our relationship with Time, Cause and Effect, progressively recalibrating our relationship between the distortions inherent to the “imperatives of survival,” wants and needs of Victim-Victimizer issues to a self-confident expression of Krystic preferences in our “transactions” with the localized planetary and galactic hologram. 통달의 태도와 자세는, 평정의 깊이를 개발해서 Divine Right Action(신성한 바른 행동)과 Divine Right Order(신성한 바른 질서)가 깨달아지는 환경이 조성되도록 돕는 가이드라인입니다. 이 통달의 영역을 탐험하길 결정하는데 있어서 우리는 선택의 힘(power of choice)을 연습해야만 합니다..그리고 행동해야 합니다. 이것을 선택과 행동의 역학(Choice and Action Mechanism)이라 부릅니다. 이 역학에는, 주지하고(aware), 깨어있고(awake), 능히 할 수 있는(able) 조건(상태)이 깃들어 있습니다. 우리의 영웅적 잠재성(Heroic Probability)과 보다 확실한 정렬을 이루기 위해, 우리는 우리자신이 무엇을 말하고 행동하는지 더욱 깨어있어야 합니다. 우리는 홀로그램에서 실재로 무엇을 창조하고 있는지에 관해 보다 깨어있도록(Awake), "의식적이 되도록(Conscious)" 분투합니다. 그리고 나서 우린 행동합니다! 우리는 부정적 평정(분리된, de-composed) 상태로 움직이거나 긍정적 평정(조합된, composed) 상태로 움직이는 선택의 힘을 사용합니다. 그것은 우리 홀로그램에 Divine Right Expression(신성한 바른 표현)과 Divine Right Action(신성한 바른 행동)의 플러스 혹은 마이너스 결과를 초래하고 우리의 시간(Time), 원인(Cause)과 결과(Effect)와의 관계에서 필수적 변화를 낳습니다. 피해자-가해자(Victim-Victimizer) 이슈들의 원함과 필요, "생존의 강박"과 내재된 왜곡들 사이에서, 우리 지역 행성과 은하적 홀로그램을 처리하는게 있어 자신감있게 크리스티악를 선호하는 표현으로, 우리 관계를 재정비하게 됩니다. Part of process of Spiritual Integration of our Higher Selves or Expansion of our Consciousness involves "re-programming" the way we think. Out thoughts create our reality and the life experience we haver internally and externally. The Attitudes and Responsibilities, when embodied and "lived", will help to change our thought patterns. Because they are part of the programming we currently carry, we take these thoughts for granted. Changing the thought patterns actually changes the programming in the personal shields. And successfully doing so presuppose that we successfully bring our conscious attention to the mindless patterns of our brain! 우리 상위자아들과의 영적인 통합 또는 우리 의식의 확장 과정 중 하나는, 우리가 생각하는 방식을 "다시-프로그래밍"하는데 있습니다. 우리의 생각은, 내적 외적으로 우리 현실과 삶의 경험을 창조합니다. "삶으로 체화될때" 태도와 책임들은 우리 생각 패턴이 바뀌도록 도울 것입니다. 생각 패턴들은 우리가 현재 지니고 있는 프로그래밍의 일부로서, 우린 생각을 당연한 것으로 여기고 있습니다. 생각 패턴을 바꾸는 것은 개인 쉴드의 프로그래밍을 실재로 변화시킵니다. 생각 패턴을 바꾸는데 성공하면, 우린 아무 생각없는(mindless) 우리 두뇌 패턴에 성공적으로 의식적 집중(주의)를 할 수 있게 됩니다. Living with and as the A&R is a way of life, a way of BE-ing. Living with and as the A&R are conditions of perception. Without an inner and outer focus on the state and healing of our consciousness, we see life through filters, with no clarity of mind or thought. A life of Kristic Consciousness will lead us to the ManU Point, that Still Point within through which we can see clearly the higher choices necessary for Divine Right Action and Divine Right Order. A&R(태도와 책임)과 함께 살고 그것으로서 사는 것은 삶의 방식이며 존재(Be-ing)의 방식입니다. A&R로서 함께 사는 것은 인식의 조건입니다. 우리 의식 상태와 치유에 내적 외적 집중없이는, 우린 명료한 마음, 명료한 생각없이 필터를 통해 인생을 보게 됩니다. 크리스틱 의식의 삶은 우리로 ManU Point,(마-누 지점)으로 이끌어 갈 것이고, 그 고요점(Still Point)를 통해서 우린 신적인 바른 행동(D.R.A)과 신적인 바른 질서(D.R.O)에 필요한 더 높은 선택을 명료히 볼 수 있습니다. The practical purpose of these teachings is to truly free and empower all, through expanded consciousness and educated enlightment, through which Revernce, Respect, Love and Co-operative Co-creation are fostered within the Global Community. These perspectives fully embrace geophysical planetary healing as an intrinsic consequence of personal alignment and expansion. 이 티칭의 실질적 목적은 확장된 의식과 교육된 계몽을 통해 모든 사람들을 진정으로 자유롭게 하고 권한을 강화하는데 있습니다. 이를 통해, 글로벌 사회 안에서 경외, 존경, 사랑과 함께 노력하는 공동-창조가 조성될 수 있습니다. 이러한 관점들은 개인적 정렬과 확장의 본질적 결과로서의 지구물리학적 행성 치유를 포괄합니다.